With the original Valiant Universe, we’ve reviewed what we think are the good and bad from the starting lineup of books. Harbinger didn’t get rave reviews from us, but X-O Manowar and Shadowman really hit the mark. We’ve glanced into the world of Turok, Bloodshot, Solar and even Archer and Armstrong, and with the Summer of Valiant hitting extremely and successfully hard last year, Valiant is getting ready to bring us even more from the original lineup. Last year we saw Ninjak debut in the new X-O, Dr. Mirage grace the pages of Shadowman, and now it’s time for H.A.R.D. Corps to get in the middle of this summer’s Harbinger Wars. Not sure what H.A.R.D. Corps is all about? Well, good for you catching this week’s Back Issue Bin! We’re gonna take a look at Valiant’s first team title and see just how well this idea has stood the test of time. 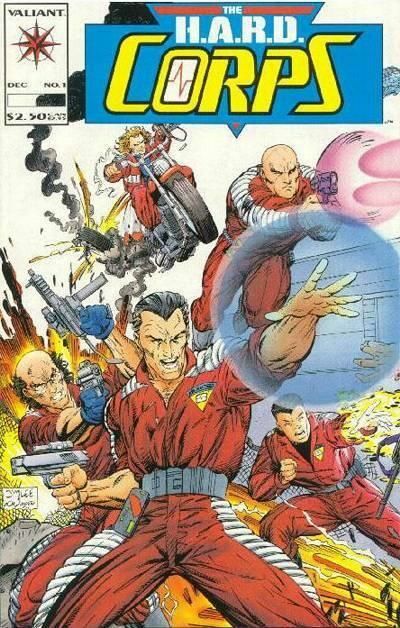 Load those plasma pistols and get a good glance at that Jim Lee cover as we go into the pages of H.A.R.D. Corps #1! Here’s how it all starts: We’re tossed right into the action as the team is crashing through a highly secured Harbinger Foundation Data Bunker. Harada, the CEO, head dude, and main cheese of the Harbinger Foundation has information that H.A.R.D. Corps wants, and they’re getting it in any way necessary. We’re introduced to the team during this: Maniac is guns blazing, screaming like a cowboy at a rodeo. Hammerhead, who digs his scars, keeps the team safe as they flee with a shield, while the likes of Superstar and Shakespeare give cover. The scene happens quick, crazy, and explosive. It only takes a minute or two before an intelligence glitch gets them stuck. Will that stop them? Pfffft! NO! Softcore, the woman behind H.A.R.D. Corps, supplies the team with what they need: Harbinger powers. Harbinger Active Resistance Division is what they stand for, and they’re put to good use. “Arc Charge!” “Airborne!” “Switch me to 14-Detination Mode!” All this and more, like switching clips from a gun, and they plow through Harada’s obviously weak security. Harada isn’t one to sit back quietly, as he unleashes what he code-named “Big Boy.” Maniac is taken down, but not before the team tries a valiant, but failed rescue. They escape, but not before leveling half of the building as well. What a way to start the day. I know David Michelinie more for his work on Spider-Man than anything else, but here, he seems right at home. The beginning part of the story really flows quite well with all the action taking place. You don’t get lost with each character. Even though it’s quick, they become very distinct and memorable. They all seem a little stiff at first, but I think that’s more a product of the times than anything else. Michelinie’s care in writing this issue firmly plants it in the Valiant Universe by bringing in Harada, arguably the most recognized villain Valiant had to offer at the time. It slows a little as the issue progresses, but again, product of the time. We need to know who the characters are, why they are, and what H.A.R.D. Corps is really all about. We’re filled in just in time too, as more action begins to take place, setting us up for the rest of the series. It’s good. It’s solid, and it has my attention. It’s not his best work, but David Michelinie definitely made it one of the more well written #1’s for Valiant at that time. David Lapham’s artwork is, what I think, the best I’ve seen from early Valiant. It’s very detail oriented, expressive, and intense. David makes it flow like scenes from a movie and keeps great pace with the story. I love the detail, especially in the beginning battle, that’s put into these pages. As the team blasts a hole through a wall, Lapham keeps pace. As they square off against “Big Boy”, you’re kept along for the ride. Even when it slows down to mission debrief, it holds true to keeping your attention. It looks great, it feels great, it is great. I do have to mention the Jim Lee cover though. I have certainly seen much better from him. Here, it just seems to be lazy and lacks that quality I’m used to from him. It’s solid at first glance, but if you’re familiar with Lee’s artwork at all, you’ll see as you look closer, that he could have done so much more with this. I’m very curious to see who from this iteration of the team makes it to the Harbinger Wars coming our way this summer. I’m already growing fond of Shakespeare and Superstar and I hope at least the templates of the characters are brought around for us. Valiant’s re-imagining of it’s universe and core set of characters has been nothing short of astounding so far. X-O Manowar was the BEST title I’ve read for all of 2012, and with Planet Death, it’s holding true for this year also . Harbinger is amazing, Bloodshot keeps me on edge, and Shadowman’s keeping great pace with the rest of the titles. If you haven’t read Valiant by now, you’re missing out on the best titles the industry has to offer. Seriously. With David Michelinie’s script and David Lapham’s artwork, H.A.R.D. Corps #1 stands out as an engaging title from Valiant’s original universe. It’s action packed, full of unique characters, and most of all, a pretty solid story with some great artwork to suit. It’s easy to find, but most of all, gets you geared up for the return of the team this summer! What are you waiting for? Don’t be a H.A.R.D. case! Get it? Ha! Parental Concern: Some blood and head evaporation, but other than that, nothing to bad.